"This war has killed so many people already. I'm just going to be another one. I can feel it the way you feel it when you're going to get a cold." 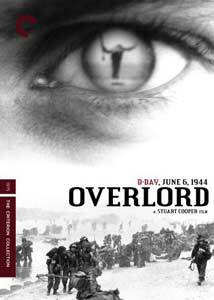 Overlord tells the story of D-Day not in vast, panoramic terms, but on a much smaller, more intimate stage, that of a young British soldier as he moves from being drafted through his ultimate fate on June 6, 1944. Director Stuart Cooper combed through thousands of hours of war footage held by Britain's Imperial War Museum, blending his selections with his own original footage, beautifully shot in black and white by cinematographer John Alcott. The result is a beautiful, haunting film shot through with images of horror both large and small scale. Tom Beddows (Brian Stirner) gets his call-up just before his 21st birthday, leaving his parents and dog behind. He experiences the travails of military life, befriending two other soldiers, Jack (Davyd Harries) and Arthur (Nicholas Ball), as the men are prepared for the invasion of Europe that looms in the near future. The men hold no illusions about their potential fate, and Tom grows increasingly certain of his future as the invasion nears. Overlord works more at establishing a general mood, rather than a reconstruction of specific events leading up to the D-Day invasion, and it comes together quite well. Through the integration of the original war footage, we get an idea of the absence of stability in the life of the common soldier. The regimentation of military life works to impose a routine and training upon the soldiers so that they can carry out their mission and hopefully survive, but the dehumanizing elements of it lead many to a well-earned fatalism, exhibited by Tom in a letter home to his parents. At the heart of the film is Tom, standing in as an everyman innocent sent to the slaughter. The script deliberately sets him up as someone unschooled about the world in many ways, which garners our sympathy as well as making him emblematic of the lives unfulfilled that were sacrificed to the invasion. No argument is made either way about this being a necessary evil; indeed, the war footage is often eerily beautiful, lending an attractiveness to the chaos it depicts. Tom's eventual fate, as foreseen by him more than once, ends up being the cruelest of fates, a death that is utterly meaningless and useless, adding nothing to the invasion aside from another tick in the body count. Image Transfer Review: The film has been transferred at its original aspect ratio of 1.66:1, and it looks very good, bringing out the best in Alcott's cinematography, which blends very well with the older footage. The older footage occasionally shows wear and tear, but that's hardly unusual and not especially distracting. Audio Transfer Review: The original mono soundtrack sounds perfectly fine; the added-in sounds of warfare during some of the archival footage is a little off-putting, but that's more a stylistic quibble. Extras Review: Criterion has thankfully seen fit to fill their release of Overlord with a nice array of extras. A commentary track with director Cooper and star Stirner covers most of the bases in the making of the film and its meaning and structure. The two were recorded separately and the tracks edited together. Mining the Archive (23m:23s) focuses on the Imperial War Museum and their contribution to the film, including interviews with two of the Museum's archivists and some extra footage from D-Day. Next, Stirner reads excerpts from two soldiers' journals (20m:41s) that inspired some of the material in the script; this section includes an introduction from Cooper. In Capa Influences Cooper (8m:00s), the director talks about photographer Robert Capa and how his work inspired the premonitions of death experienced by Tom in the film. Germany Calling (2m:06s) is the full version of the film as seen in the movie house sequence in the film, featuring footage from Triumph of the Will comedically edited to the music hall number The Lambeth Walk. Cameramen at War is a 1943 Ministry of Information propaganda piece about the men filming the fighting men. Finally, Cooper's striking 1969 short film A Test of Violence (14m:15s) looks at the paintings of Spanish artist Juan Genoves. And, wrapping things up, it wouldn't be a Criterion release without a nice booklet, here gathering a Kent Jones essay, an excerpt from a speech about the Imperial War Museum given with a screening of the film last year, and excerpts from a novelization of the film by Cooper and co-writer Christopher Hudson. This isn't a film I consider "entertaining" in the usual fashion, but I found it extremely engrossing and moving. There's nothing patriotic about it; it's a simple, unadorned story of a young man fed into the military machine. The film is bolstered by several worthy extras in the standard Criterion fashion.